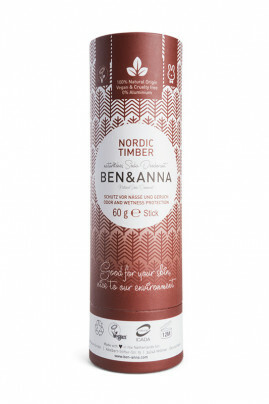 The Ben & Anna Nordic Timber Natural Deodorant Stick Papertube does not block the natural process of perspiration. Thanks to its composition in baking soda, it neutralizes bad smells. Enriched with shea butter, it nourishes the skin deeply. It wraps your underarms with a woody scent of cedar with subtle warm shades of palmarosa. Easy to apply, it is packaged in 100% recyclable cardboard. respects the nature and the epidermis! Before the first use, gently press on the lower part of the deodorant stick. Push the bottom of the tube with your thumb to mount the deodorant. Apply the natural deodorant on clean, dry, non-irritated armpits. A deodorant with natural ingredients and recyclable packaging!